Francis D. Colburn or COBURN was born on 16 Dec 1797 in , , New Hampshire. He died on 28 Oct 1871 in , Vermilion, Illinois. Francis married Cynthia MORGAN in Jan 1848. Cynthia MORGAN [Parents] was born on 17 Dec 1797 in Fairmont, Marion, West Virginia. She died on 28 Aug 1882 in , Vermilion, Illinois. She was buried in 1882 in Georgetown, Vermilion, Illinois. Cynthia married Francis D. Colburn or COBURN in Jan 1848. John UNDERWOOD was born on 19 Jan 1794 in Farmington, , Virginia. He died on 25 Sep 1858 in Georgetown, Vermilion, Illinois. John married Drusilla MORGAN on 10 Dec 1818 in Morgantown, Monongalia, Virginia. Drusilla MORGAN [Parents] was born on 2 Apr 1801 in , Monongalia, West Virginia. She died on 3 Sep 1884 in Georgetown or Eugene, Vermillion, Indiana. Drusilla married John UNDERWOOD on 10 Dec 1818 in Morgantown, Monongalia, Virginia. Nancy A. UNDERWOOD was born on 7 Oct 1819 in , Monongalia, West Virginia. She died in Mar 1871. Susannah M. UNDERWOOD was born on 10 Jul 1821 in , Monongalia, West Virginia. She died on 19 Aug 1900. Henry M. UNDERWOOD was born on 27 Feb 1823 in , Monongalia, West Virginia. He died on 19 Apr 1894 in Eugene, Indiana. Achillies Morgar UNDERWOOD was born on 16 Sep 1824 in , Monongalia, West Virginia. He died in Jun 1908 in Burlington, Coffey, Kansas. John Downing UNDERWOOD was born on 12 Mar 1825 in West Maryland, , Virginia. He died on 5 Apr 1900 in Alden, , Iowa. Mary A. UNDERWOOD was born on 8 Sep 1827 in Georgetown, Vermilion, Illinois. She died on 8 Nov 1827 in , Vermilion, Illinois. M vii George Washington UNDERWOOD was born on 7 Dec 1828. He died on 8 Feb 1898. Drusilla J. UNDERWOOD was born in 1829. She died on 20 Sep 1882. Silas Dinsmore UNDERWOOD was born on 23 Nov 1830 in Georgetown, Vermilion, Illinois. He died on 20 Sep 1898 in , Vermilion, Illinois. Harrison Shelby UNDERWOOD was born on 25 Aug 1832 in Georgetown, Vermilion, Illinois. He died on 22 Jan 1870 in Danville, Vermilion, Illinois. Levi C. UNDERWOOD was born on 21 Oct 1834 in Georgetown, Vermilion, Illinois. He died on 21 Jul 1916 in McKendree Twp, Vermilion, Illinois. He was buried on 25 Jul 1916 in McKendree Cemetery, McKendree Twp, Vermilion, Illinois. William Oliver UNDERWOOD was born on 10 Jul 1836 in Georgetown, Vermilion, Illinois. He died on 10 Jul 1916 in Unionville, , Missouri. Aaron UNDERWOOD was born on 22 Sep 1840 in Georgetown, Vermilion, Illinois. He died on 16 Nov 1893. F xiv Brookie C. UNDERWOOD was born on 14 May 1843. She died in May 1870. Thomsas UNDERWOOD was born on 2 Dec 1847 in Georgetown, Vermilion, Illinois. He died on 26 Sep 1857. Levi MORGAN "Sr" [Parents] was born on 19 Jan 1806 in , Monongalia, Virginia. He died in 1860 in , Grimes, Texas. Levi married Jane JONES on 7 Sep 1826 in , Edgar, Illinois. Jane JONES [Parents] was born on 5 Oct 1801 in , Christian, Kentucky. She died about 3 Jun 1844 in , Grimes, Texas. Jane married Levi MORGAN "Sr" on 7 Sep 1826 in , Edgar, Illinois. F i Drucilla MORGAN was born about 1827. She died in 1862. M ii William Thomas MORGAN was born in 1831. Drucilla MORGAN was born in 1834 in , , Illinois. James B. MORGAN was born in 1837 in Vermillion, , Illinois or, Grimes, Texas. M v Levi MORGAN "Jr" was born on 19 Jan 1839. He died in 1872. Lucretia MORGAN was born in 1843 in , Grimes, Texas. F vii Lusinda "Louisa" MORGAN was born on 22 Jun 1844. She died on 27 Aug 1923. Levi MORGAN "Sr" [Parents] was born on 19 Jan 1806 in , Monongalia, Virginia. He died in 1860 in , Grimes, Texas. Levi married Mahala WIXOM on 11 Sep 1845. Mahala WIXOM [Parents] was born in 1809 in , Cayuga, New York. She died in 1860 in , Lee, Texas. Mahala married Levi MORGAN "Sr" on 11 Sep 1845. F i Mahala Anaste MORGAN was born on 12 Feb 1846. She died in 1931. Thomas Scott MORGAN [Parents] was born on 3 Jul 1808 in , Monongalia, West Virginia. He died on 28 Jul 1869. Thomas married Brooky KYGER on 20 Feb 1834. Brooky KYGER was born on 17 Aug 1817 in , Monroe, Ohio. She died on 8 May 1852 in Georgetown, Vermilion, Illinois. Brooky married Thomas Scott MORGAN on 20 Feb 1834. Thomas Scott MORGAN [Parents] was born on 3 Jul 1808 in , Monongalia, West Virginia. He died on 28 Jul 1869. Thomas married Phoebe Ann LIGHTNER on 29 Aug 1852. Phoebe Ann LIGHTNER was born on 27 Feb 1827 in , , Virginia. She died on 8 May 1852. Phoebe married Thomas Scott MORGAN on 29 Aug 1852. Jeptha HENSLEY was born in 1810. Jeptha married Elizabeth MORGAN on 19 Jan 1832 in , Vermilion, Illinois. Elizabeth MORGAN [Parents] was born on 1 Jan 1813 in , Monongalia, West Virginia. Elizabeth married Jeptha HENSLEY on 19 Jan 1832 in , Vermilion, Illinois. George Dinsmore HENSLEY was born in 1843. Col. Morgan Ap MORGAN "I" [Parents] was born on 1 Nov 1688 in Glamorganshire, Wales. He died on 17 Nov 1776 in Bunker Hill, Berkeley, Virginia. Morgan married Catherine GARRETSON in 1713 in Christiana, New Castle, Delaware. Catherine GARRETSON [Parents] was born on 5 Jun 1692 in Christiana, New Castle, Delaware. She died on 16 May 1773 in Bunker Hill, Berkeley, Virginia. Catherine married Col. Morgan Ap MORGAN "I" in 1713 in Christiana, New Castle, Delaware. M i James MORGAN was born on 22 Aug 1715. He died in 1731. F ii Anne MORGAN was born in 1716. She died in 1763. M iii David MORGAN "Sr" was born on 12 May 1721. He died on 19 May 1813. M iv Charles MORGAN was born on 20 Mar 1724. He died in 1788. M v Henry MORGAN was born on 10 Aug 1727. He died in Apr 1824. M vi Evan "Chunk" MORGAN was born on 25 Nov 1731. He died on 25 Nov 1791. M vii Col. Zackquill MORGAN "I" was born on 8 Sep 1735. He died on 1 Jan 1795. M viii Rev. Morgan MORGAN "II" was born on 20 Mar 1737. He died on 20 Oct 1797. William BAINBRIDGE was born about 1766. He was buried in , Marion, West Virginia. William married Sarah MORGAN. Sarah MORGAN [Parents] was born on 2 Dec 1770 in , Monongalia, West Virginia. She died before 31 Oct 1826. Sarah married William BAINBRIDGE. Morgan "Paddy Mod" MORGAN [Parents] was born on 20 Jun 1774 in Morgantown, Monongalia, West Virginia. He died on 28 Aug 1868 in Fishing Creek, Wetzel, West Virginia. He was buried in @ Farm, Fishing Creek, Near Porter's Falls, Wv. Morgan married Mary HOULT on 25 May 1801 in , Monongalia, West Virginia. Mary HOULT was born on 14 Nov 1777 in , Saint Marys, Maryland. She died on 26 Oct 1826 in Porter Falls, Wetzel, West Virgniia. Mary married Morgan "Paddy Mod" MORGAN on 25 May 1801 in , Monongalia, West Virginia. Elisha MORGAN was born on 17 Dec 1802 in , Monongalia, West Virginia. Dorothy MORGAN was born in 1806 in , Wetzel, West Virginia. Elizabeth MORGAN was born on 1 Jan 1810. 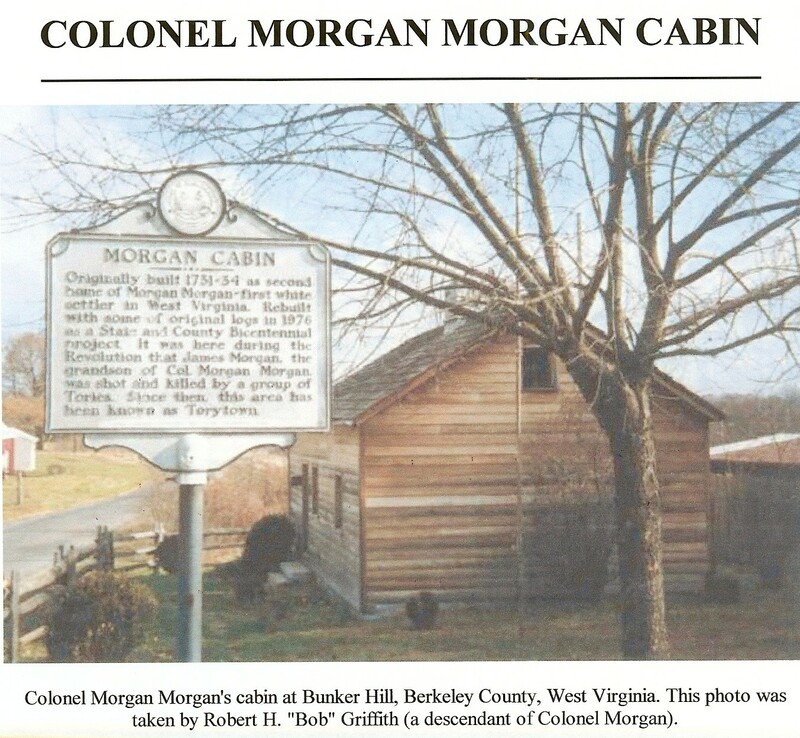 Hiram Job MORGAN was born in 1814 in , , West Virginia.